My mission is to help you improve your business and you can only really do that through marketing, which in turn will help you get more profits, more sales, and more customers. This will make your life much more easier. Am I right? I started from absolutely nothing, sold a business and started all over again online. If I can do it, you can do it. So today, we are talking about pricing. This subject comes up again and again and again. In a world where there seems to always be something in recession, this is a great subject to talk about. If you live in Canada, you will read over and over again about the supermarket battles. If you are in the USA, guess what? It will be coming to you sooner than you think. When the big supermarkets out there are the only one in their town to offer groceries, there is not much competition. But you add in one of the little guys, such as Aldi and other, then that is when the supermarket battles begin. The next thing you know, each one is battling it out about price. But it does not have to be like that. Price is not going to win it. As you can see with the supermarkets, when one advertises that they dropped their prices, then the next thing you know, another has done the same. Pretty soon, they are all dropping prices to beat the other one and once the prices have been dropped and started eating into the profits, that takes away a lack of investment. For you and I, we are not in that game. Price is not it. You need to get that in your heard. You need to know the end game when it comes to the customer. You cannot just phone them up and ask them. You need to know this from the get go. You can do all kinds of market research. Let me give you this simple statement. Only one supplier can be the cheapest out of every other supplier on the market at any given time. Of course another can match it, but only one at a time can do it. Now why is this bit of knowledge important? Because this means if one is lower, the others are still in business! Which means, it has nothing to do with the price. You can look up and do shopping comparison online and find who has the lowest price online, but that does not always necessarily mean that they are going to buy from the person who has the lowest price. These are all reasons that someone would choose a company over another company that has the lowest price. Again, it is not all about the price. Tell the truth and put these benefits on your flyer or website or business card. This makes all the difference when potential customers are looking to buy. You have to create the reason why your customers want to choose you instead of someone who has a cheaper price than you do. I do not want you to get stuck on that so get that out of your head. Today is Thursday and that means that it is time for a drive time podcast. 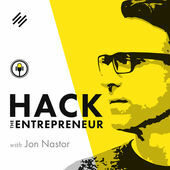 Today is Hack Entrepreneur with Jon Nastor. He has been podcasting for quite a while. He is an entrepreneur and explains how he does it and does it well. This is a very good podcast with a ton of listeners and is incredibly popular. Now, tomorrow’s ones to watch podcast is Justin Stenstrom who owns Elite Man magazine so I suggest you listen to it and let me know what you think. Until then, I hope you have a great rest of the week and I will be back on Monday with another great tip.